Easter Island may be one of the most remote spots in the world. It's nearest neighbor, Pitcairn Island, is 1,289 miles to the west. 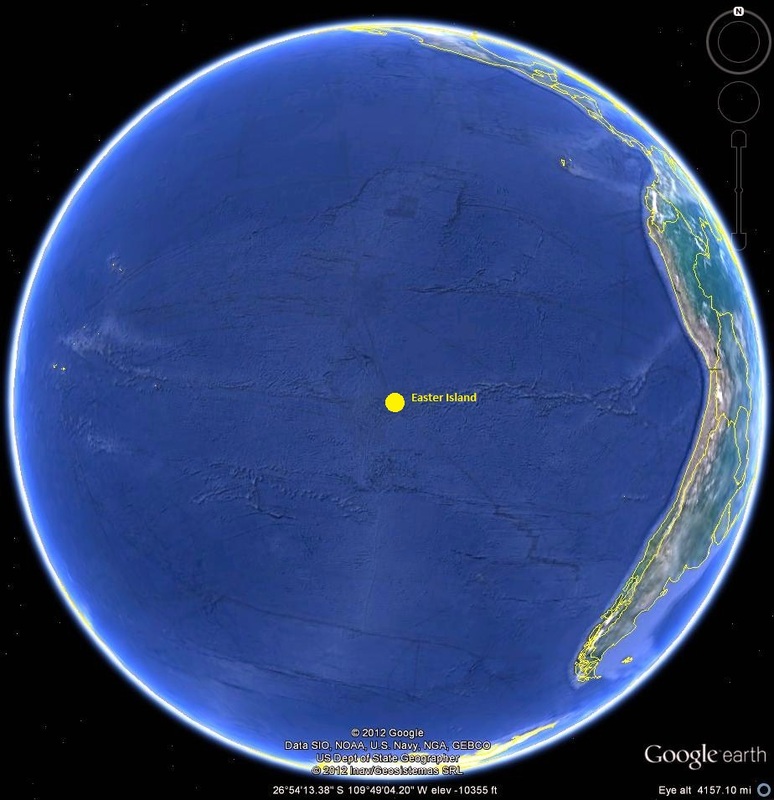 Easter Island is claimed and ruled by Chile, which is 2,180 miles to the east. 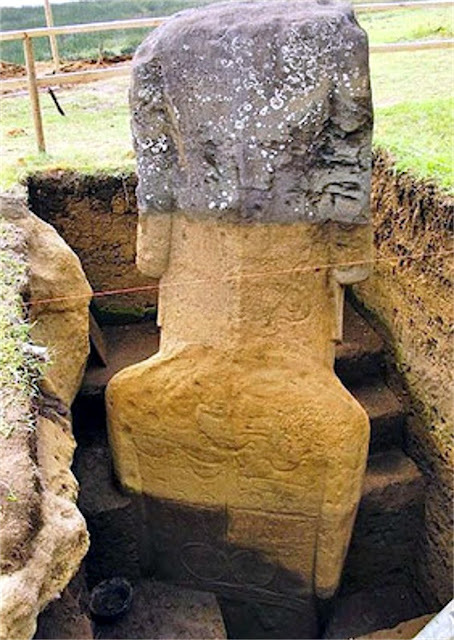 Easter Island was originally populated by a tall Polynesian people who are called the Rapanui, (although this is a borrowed Tahitian name), and they call their island, "Te Pito o TeHenua" or "The End of the Land." The original settlers, the Rapanui, may have never numbered more than 5,000 or so. When they were discovered by Spanish explorers in the 1700's, their population had already been decimated by civil war, cannibalism and ecological disruption. 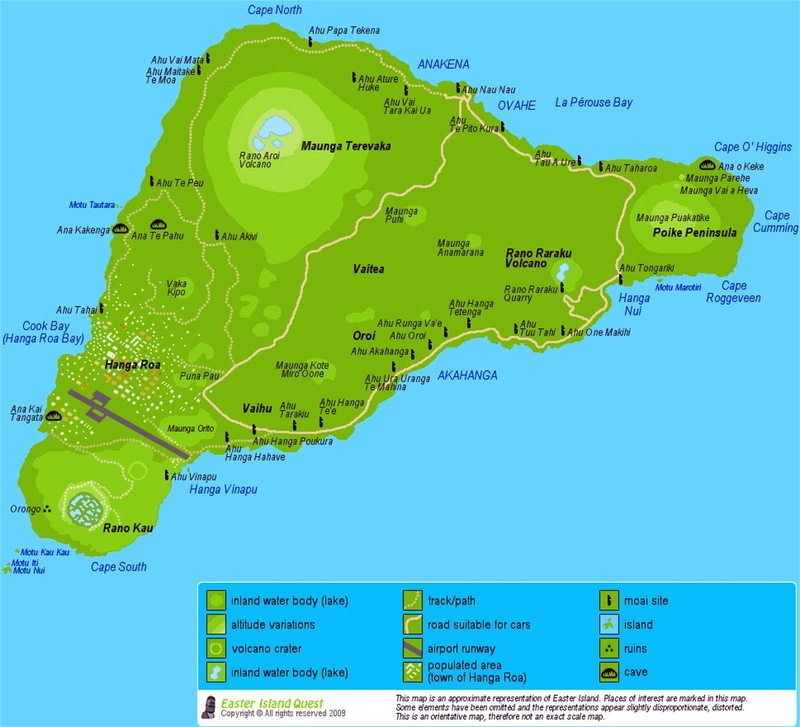 For example, the first Europeans found absolutely no trees on the island, although research shows that palm trees and other trees were abundant previously. To this the Spanish conquistadores added their own blessings of disease, military invasion and slave raids. In the end, there were only 36 individuals left of the original population. Because of this genocide (combined with what you might call 'group suicide'), almost all of the individuals who knew anything about the past or culture of Easter Island were killed or died in slavery. Consequently, we have hardly any knowledge of anything the Rapanui could tell us about themselves or their past. The immediately identifiable icon of this mysterious place is the image of the strange stone figures, called by the natives "moai." 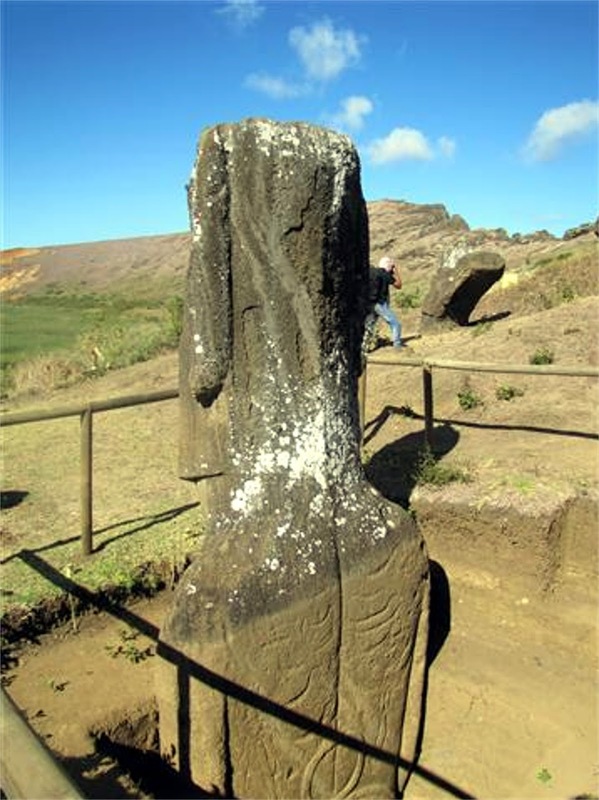 The moai are carved of the volcanic rock of which the whole island consists. 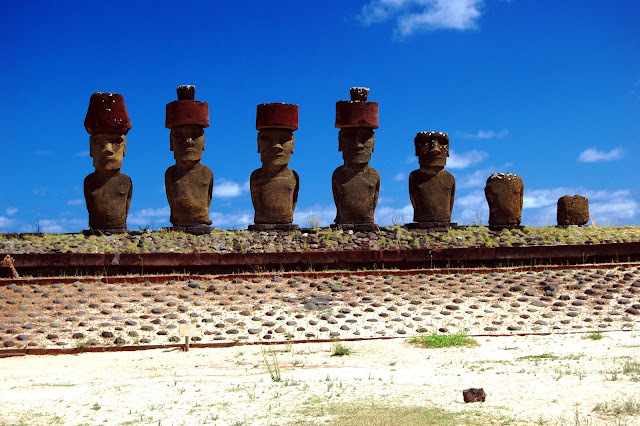 There are about 877 of these moai scattered in various places about the island. The ones that have been erected are up to 33 feet tall (5 or 6 times taller than you) and weigh up to 86 tons (remember, a ton is about the weight of a standard passenger sedan). There are moai still in the quarries that are almost twice that size. destinations all over the island and then set them upright. As with the experiments to explain how the Great Pyramids and Stonehenge were built, all have failed. 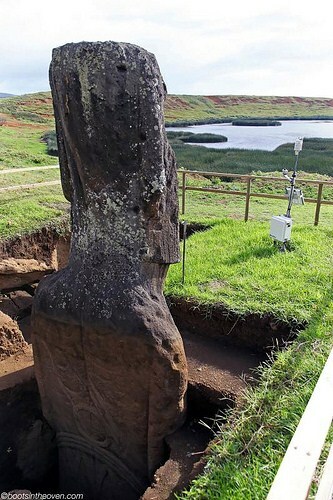 Many of the moai are placed on large flat stone platforms, called by the natives "ahu." 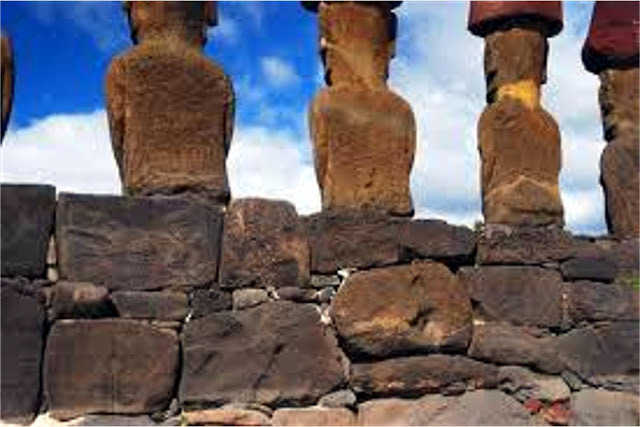 The ahu are themselves constructed of very large stones. 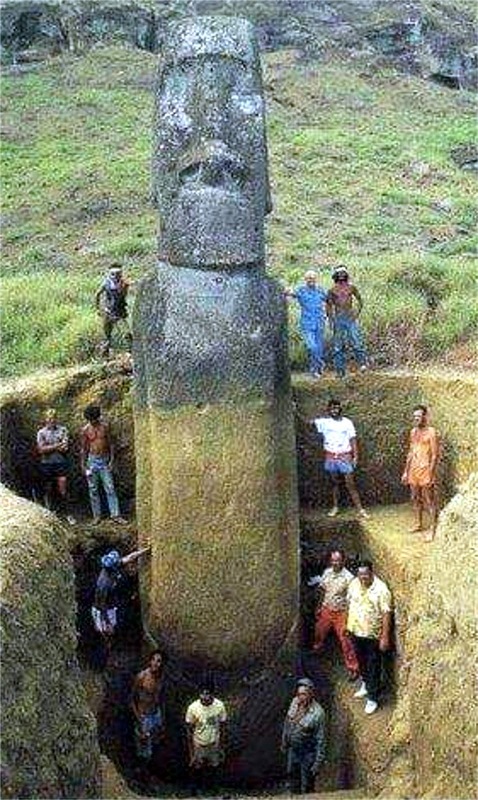 This would be an additional 6 to 10 feet that the Rapanui would have to raised the 80 ton moai to set them in place. When various travelers, explorers, anthropologists and archaeologists have asked the surviving Rapanui how their ancestors moved the moai and set them on their ahu's (because, remember, we're all civilized and technologically sophisticated and far superior to the primitive Rapanui and we can't figure out how they did it), the answer is invariably the same. 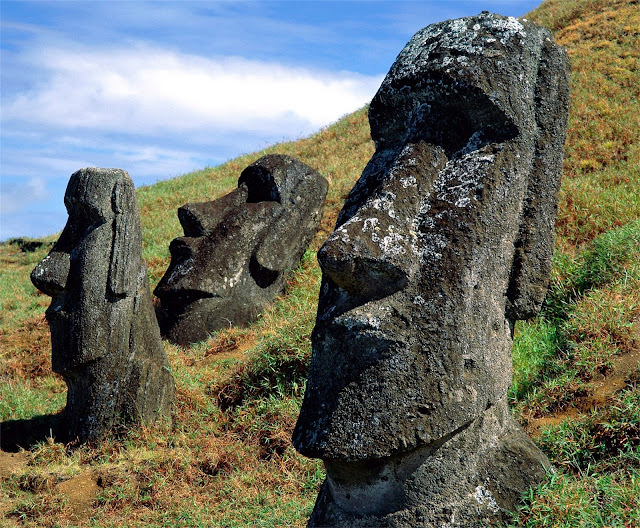 "The moai walked to their ahu's." A relevant thing to note is that most of the statues that we see show only the head. Yet all of these statues also have arms and torsos. You are only seeing a third of the total statue, as depicted in some of the photos above. 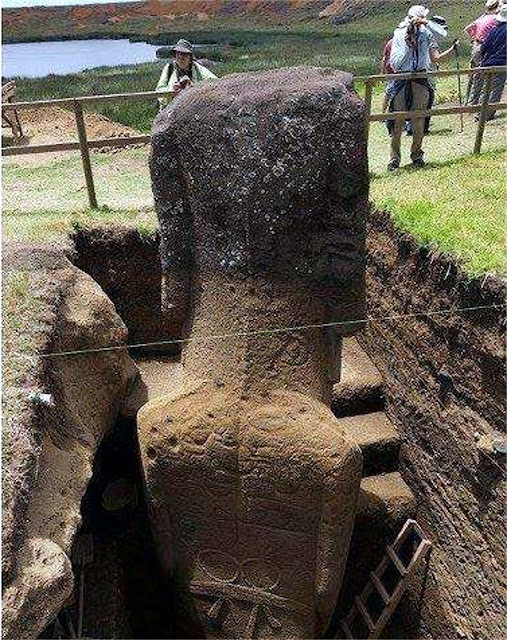 While archaeologists tell us that the Rapanui arrived on Easter Island no earlier than the 300's A. D., and that they are the ones that carved these statues, it would take thousands of years for the moai to sink 20 to 30 feet into the soil below them. Yet that is exactly how deep they are, again depicted in the photos above. So.....what? Did the Rapanui go to all this labor to carve these gigantic figures and move them, then proceeded to routinely bury 2/3 of each statue, up to their necks? As usual, things aren't adding up with the stories the uniformitarian archaeologists are feeding us. Another of the mysteries of Easter Island are the rongorongo, or "talking boards." 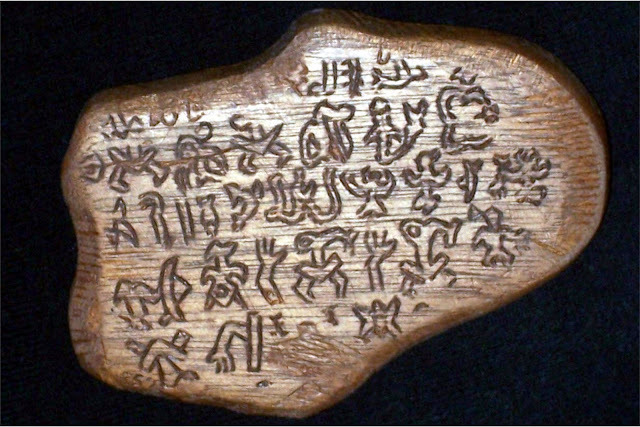 Europeans noticed that the Rapanui, who lacked firewood, (remember, ALL of the trees were gone from the island) were burning certain very old boards that they called rongorongo. The Europeans noted that the boards were covered with a very densely packed, complex hieroglyphic form of script. 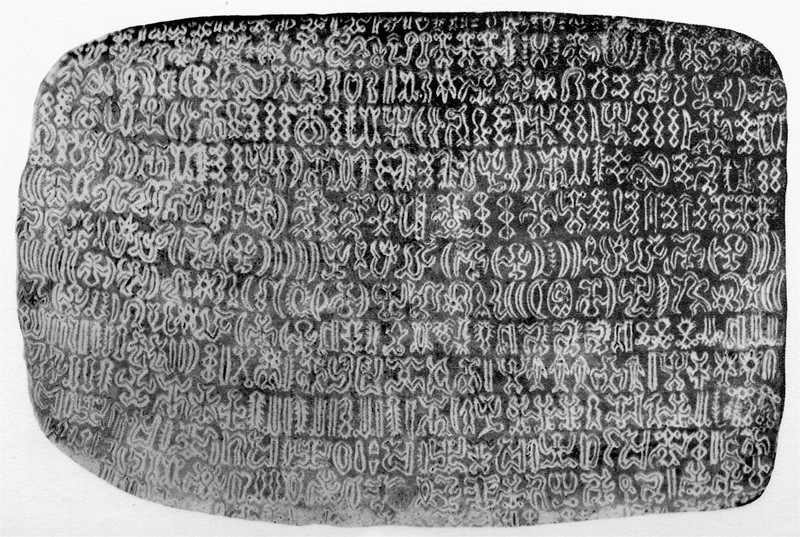 Since all of the people who knew anything about this script were dead (chiefs, priests, elders), the surviving Rapanui had no idea what the rongorongo represented and they surely could not read them. About 24 have been collected. 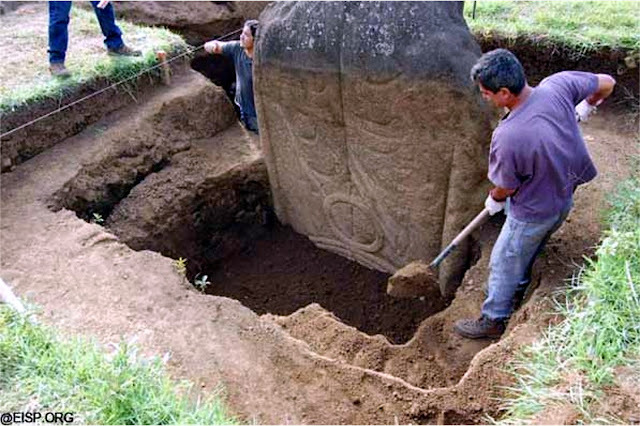 None of them are on Easter Island any more and all are densely covered with over 14,000 different and very complex glyphs. There are no rongorongo Rosetta stones, nor are there ever likely to be, so the chances of ever decyphering them are slim, short of building a time machine and going back to find someone who can read them. It is also relevent to note that, in one of the few stories that the Rapanui retain, they tell how their ancestors came to Easter Island from a far-away continent. The story says that the people there were numerous and technologically advanced. 1. How could a supposedly primitive people - never numbering more than 5,000 or so - cut, transport, elevate and set up massive stones that even our most powerful modern cranes would have difficulty in dealing with? 2. Why would a small, isolated group of people develop an extremely complex written form of communication, when none of the closest neighboring peoples (the other Polynesian cultures on the west, nor the Inca on the South American coast to the east) had even begun to do so. When I was a probation officer and somebody told me a story that didn't make sense, I knew that somebody was either lying or withholding some critical information. From that point, the hunt for the truth was on. When it comes to what has happened in ancient times (not just on Easter Island, but all over the world), many of the stories don't make sense.